Traditional automakers with primarily-ICE portfolios saw sharp drops in year-over-year U.S. auto sales in September 2018, even as Tesla closed the month on a record note. The traditional auto industry has been in a slide for a while now, with September seeing all major players are reporting slumped numbers for 2018 over 2017. Meanwhile, Tesla is having unique problems of its own – too much demand and too little time in which to fulfill it. Read: Tesla Averaged 4100 Model 3s Produced Per Week in Q3, Can It Still Be Profitable? 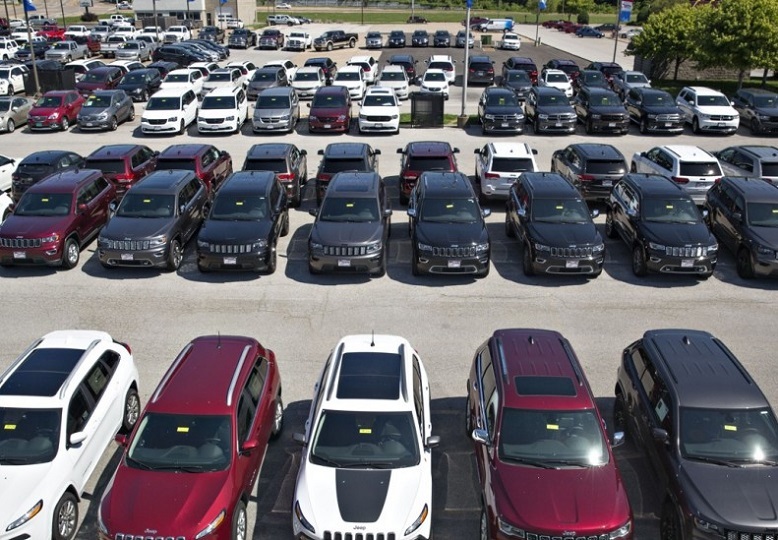 This September’s sales slump was caused partially by a great September 2017, which saw people coming in droves to replace cars lost to Hurricane Harvey. One the worst-hit markets was parts of southeastern Texas. This time, however, Hurricane Florence has residents of both Carolinas busy with matters other than buying a new car as they continue to deal with the effects of the deluge. FCA was lifted by the tide of strong sales in the Ram and Jeep divisions, and seems to be the only major player to escape the September U.S. sales massacre, actually posting a 15% growth year-over-year. Honda didn’t too badly, reporting a 7% decline in September sales. The 6.3% increase in the larger SUV and pickup truck segments, however, was unable to offset the shocking 19% decline in passenger cars. General Motors posted an 11.1% decline, again with a sharp decrease in passenger car sales. The company has a lot riding on the new GMC Sierra and Chevy Silverado trucks, and expects Q4 to be ably supported “when our next wave of new products start shipping in high volume,” according to GM’s VP of U.S. Sales, Kurt McNeil. Ford reported a similar 11.2% overall decline. Surprisingly, the F-Series dropped 9%, while SUVs dropped 2.7%. The real jaw-dropping news is the stomach-churning 26% drop in sedan sales. Honda’s 19% decline in the passenger car segment pales in comparison. But neither of them gets the ‘greatest sales drop’ trophy. That would have to go to Nissan. Nissan saw passenger car sales doing a free-fall of 35.7% in September on a year-over-year basis. Overall decline was 12.2%, with pickup and SUV sales softening the blow with their 6.6% sales growth. No less shocking is Toyota’s September drop of 28% in the passenger segment for an overall decline of 10.4%. The Camry disappointed big time, losing 17% after it was redesigned, ironically, to expand market share while riding a winning streak. Tesla has never experienced sales problems ever since the first Roadster was launched many years ago. As a relative infant in the world of automobiles, it still has teething issues with things like production and paint. Its problem is very different – how to make the most number of cars it can in the shortest time possible. But as we contrast Tesla with traditional automakers and their deplorable September sales in the U.S., we suddenly realize that this company is actually going to make it to the next level. Tesla – on the strength of Musk’s hard-headed optimism – is going to make it into the next century even as traditional companies struggle with the transition to electric vehicles. If you read about the Jaguar I-Pace launch and saw its claims for range and speed, you’ll know exactly how much of a head start Tesla has in this now-inevitable road to electrification. Big Auto must not only stem the bleeding at the sales end, but prepare their fleets for an electric future. Tesla is already the largest U.S. automaker by market cap, and this is now the new and stubborn benchmark for the ICE industry. Decades from now they’ll talk about how Tesla was once a tiny $50 billion company that valiantly fought off the Volkswagens and the Toyotas of the world to establish a majority presence in the global automobile market. Perhaps this September’s U.S. auto sales were a reminder that such a future might not be too far away – hurricanes or not.